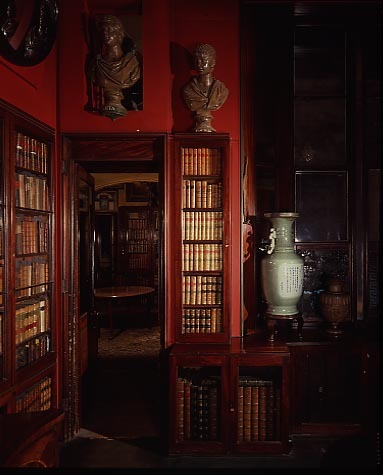 A grander library than mine ... photograph of Sir John Soane's library. Source: Sir John Soane's Musuem. Tyler Cowen is blogging it. Matt Yglesias is blogging it. Bryan Caplan is too. So I thought I’d post my list of ten books that have most influenced my intellectual development. Behold – no Ayn Rand! 1. The Guns of August by Barbara Tuchman. Because it’s a Tuchman book, it’s beautifully written and flawlessly narrated. But the big take-home message for me was how quickly the best-laid plans of the various combatants of 1914 came to grief, and how bereft they were of a plan B once “mobile warfare” had solidified. A brilliant case study in unintended consequences. 2. The Nichomechean Ethics by Aristotle. Aristotle’s supple wisdom still rings true today as he analyses the human virtues as way of good living. 3. In Search of Lost Time by Proust. Taught me about love, and obsession, and human changeability, and the Dreyfus affair. Also taught me that ploughing through a difficult multi-volume novel for months can be intensely rewarding. 4. Landscape and Memory by Simon Schama. The best book about art history I have ever read, by one of the grandest contemporary historians. 5. The Space of Literature by Maurice Blanchot. Perhaps one of the most intense works of literary criticism of all time. 6. Illuminations by Walter Benjamin. Still the best introductory collection. 7. The Selfish Gene by Richard Dawkins and Straw Dogs by John Gray. I conflated these two as together they represent two of the most incisive critiques of humanism, as well as two of the best-argued. 8. Essays by Montaigne. And for the defence of humanism, we have Montaigne, whose literary generosity has perhaps never been surpassed. 9. The Man Without Qualities by Robert Musil. Still perhaps my favourite ever comic novel. Contains multitudes. 10. The Age of Extremes by Eric Hobsbawm. Glory in the broad-brush sweep of contemporary history, marvel at the quality of his judgment, wonder at the scope of his compass. Although not specifically relevant to the typical topic area of my blog, Amartya Sen’s fine sketch of Adam Smith in the Financial Times is well worth a blog post. It’s part of an excellent broader series on the future of capitalism edited by the FT’s Martin Wolf. Smith never used the term capitalism (at least, so far as I have been able to trace), and it would also be hard to carve out from his works any theory of the sufficiency of the market economy, or of the need to accept the dominance of capital. He talked about the important role of broader values for the choice of behaviour, as well as the importance of institutions, in The Wealth of Nations ; but it was in his first book, The Theory of Moral Sentiments, published exactly 250 years ago, that he extensively investigated the powerful role of non-profit values. While stating that “prudence” was “of all virtues that which is most helpful to the individual”, Smith went on to argue that “humanity, justice, generosity, and public spirit, are the qualities most useful to others”. Robert Darnton has written a long and interesting article about the Google books class action at the New York Reveiw of Books, entitled Google and the Future of Books. One way to understand this system is to draw on the sociology of knowledge, notably Pierre Bourdieu’s notion of literature as a power field composed of contending positions within the rules of a game that itself is subordinate to the dominating forces of society at large. But one needn’t subscribe to Bourdieu’s school of sociology in order to acknowledge the connections between literature and power. Seen from the perspective of the players, the realities of literary life contradicted the lofty ideals of the Enlightenment. Despite its principles, the Republic of Letters, as it actually operated, was a closed world, inaccessible to the underprivileged. Yet I want to invoke the Enlightenment in an argument for openness in general and for open access in particular. Darnton argues there is a similar tension between the principles of free access and open information embodied by many libraries and educational institutions, and the money and power at stake in the information they generate, distribute and control. He points out that copyright is specifically set down in Article I of the United States Consititution ‘”for limited times” only and subject to the higher purpose of promoting “the progress of science and useful arts.”‘ In the 1780s this meant a 14 year term with one extension. Now, of course, copyright has lengethened to more than a century. This long and interesting article is in many ways an elaboration and commentary on Lawrence Lessig’s work, but contains many fascinating observations of the contentious interface between the public and prviate spheres of knowledge. For instance, did you know that relatively obscure journals charge tens of thousands of dollarsz to public and unviersity libraries? … the Journal of Comparative Neurology now costs $25,910 for a year’s subscription; Tetrahedron costs $17,969 (or $39,739, if bundled with related publications as a Tetrahedron package); the average price of a chemistry journal is $3,490; and the ripple effects have damaged intellectual life throughout the world of learning. Owing to the skyrocketing cost of serials, libraries that used to spend 50 percent of their acquisitions budget on monographs now spend 25 percent or less. University presses, which depend on sales to libraries, cannot cover their costs by publishing monographs. And young scholars who depend on publishing to advance their careers are now in danger of perishing. … here is a proposal that could result in the world’s largest library. It would, to be sure, be a digital library, but it could dwarf the Library of Congress and all the national libraries of Europe. Moreover, in pursuing the terms of the settlement with the authors and publishers, Google could also become the world’s largest book business—not a chain of stores but an electronic supply service that could out-Amazon Amazon. The problem, Darnton realises, is that Google is not just creating the world’s largest library: it is also creating the world’s largest research infrastructure monopoly, one controlled in the end by the board of a for-profit corporation – for good or evil. Looking back over the course of digitization from the 1990s, we now can see that we missed a great opportunity. Action by Congress and the Library of Congress or a grand alliance of research libraries supported by a coalition of foundations could have done the job at a feasible cost and designed it in a manner that would have put the public interest first. By spreading the cost in various ways—a rental based on the amount of use of a database or a budget line in the National Endowment for the Humanities or the Library of Congress—we could have provided authors and publishers with a legitimate income, while maintaining an open access repository or one in which access was based on reasonable fees. We could have created a National Digital Library—the twenty-first-century equivalent of the Library of Alexandria. It is too late now. Not only have we failed to realize that possibility, but, even worse, we are allowing a question of public policy—the control of access to information—to be determined by private lawsuit.